This heirloom quality Amish dresser will provide years of use. Choose to add the matching vertical iron mirror to complete the look. 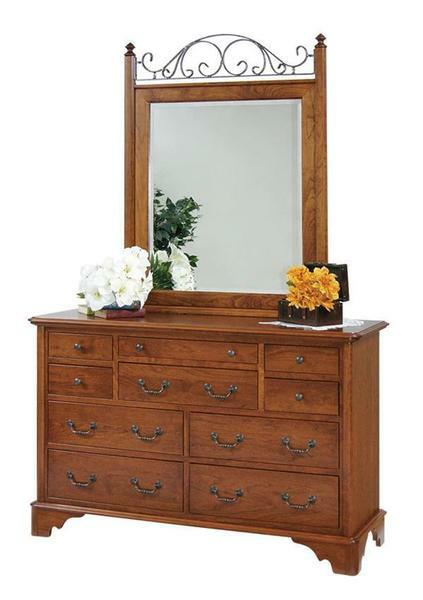 This hardwood dresser measures 60" high and offers 10 drawers for plenty of storage space. Choose to have this dresser made in a custom wood selection of our standard oak or cherry wood. Our Amish furniture specialists will be happy to provide you with a quote. We can also customize this dresser to fit your space as well as do custom stain matching. After an order is placed we will send you out stain samples to confirm your stain selection. If an order is placed online expect to receive these in the mail. The standard features of this dresser include Solid Hardwood Construction, Dovetail Drawers, Solid Wood Drawer Slides and Dust Covers Between Drawers. We offer upgrade options for the drawer slides as well as a variety of finish packages. Bring a conservation but refined Colonial style into your home with this Early American Dresser.